While all eyes are focused on Tesla's Model 3 ramp and Elon Musk's erratic behavior, rivals are unveiling compelling high-end electric cars. Intensifying high-end competition could spell more pressure for Tesla (TSLA - Get Report) to execute on its huge Model 3 production ramp. For the time being, the Model 3 lacks a true peer in the sub-$50,000 electric car market. While rival vehicles such as the Nissan Leaf and Chevy Bolt have their fans, reviews make it clear that the Model 3 is cut from a different cloth in fields such as looks, handling and performance. It also comes with a superior infotainment system, and -- should a buyer opt for the Model 3's Premium Interior and Enhanced Autopilot options -- can also provide luxury trimmings and driver-assistance features that products like the Bolt and Leaf can't match for now. The Model 3 will face somewhat tougher competition in 2019, as the likes of Volvo and Volkswagen launch new electric cars. But judging by what's known about the upcoming launches, it's hardly panic time. The upcoming electric version of Volvo's XC40 car, for example, is positioned as a compact SUV rather than a premium sedan. And based on both its looks and its promised performance, Volkswagen's upcoming electric I.D. cars, which will be available in crossover and hatchback form, are closer in spirit to the Bolt and Leaf than they are to the Model 3. Moreover, Volkswagen doesn't plan to start building electric I.D. cars until November 2019. Provided that Tesla, which is for now only shipping the Long Range, Dual Motor All-Wheel Drive and Performance versions of the Model 3, makes good on its promise to ship the $35,000 Standard version of the car by early 2019, it shouldn't have to worry too much about direct Model 3 competition in the near-to-intermediate term. On the high-end, however, things are starting to get more interesting. Earlier this year, Jaguar launched its I-Pace electric SUV, which at a $69,500 starting price takes direct aim at Tesla's Model X crossover. Reviews for the car, which Alphabet's (GOOGL - Get Report) Waymo is (after retrofitting the cars) adding to its self-driving car fleet, have been pretty good. "If Tesla has the Jaguar beat on charging time and convenience, the Jaguar's style, luxury, performance and price might have [Elon] Musk upping his Ambien intake," quipped The Drive's Lawrence Ulrich in a recent review. Next year, Jaguar plans to take on Tesla's Model S luxury sedan by launching an electric version of its XJ sedan. And Audi will be going after the Model X and Model S with all-electric versions of its e-tron SUV and e-tron Sportback "SUV coupe." The e-tron SUV recently went into production. Mercedes-Benz, meanwhile, made waves earlier this month by unveiling its EQC electric SUV, which also takes aim at the Model X. Porsche, for its part, plans to launch a powerful electric sedan known as the Taycan. The company suggests the Taycan's price will be close to that of its Panamera sedan, which starts at $85,000. All that extra competition, together with the Model 3's production ramp, could put some pressure on Tesla's Model S and X sales, which have already begun to plateau. Tesla expects to deliver a combined 100,000 Model S and X units this year, which represents just a slight increase from its 2017 deliveries for the cars. 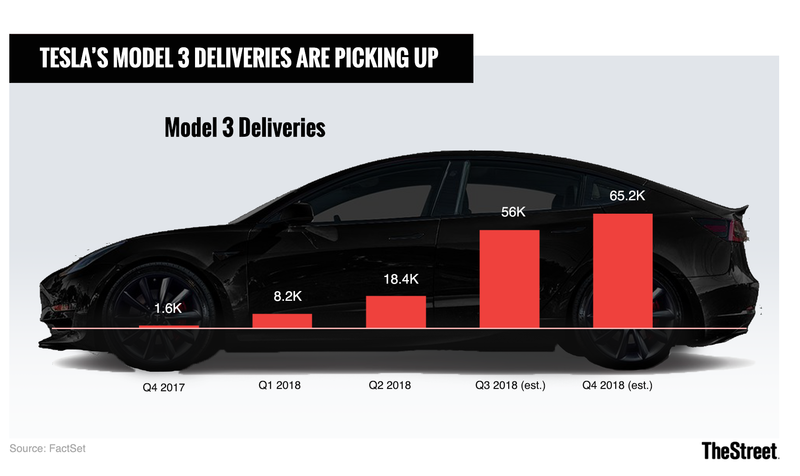 On an annual basis, Model S deliveries are expected to be down moderately during the second half of 2018, while Model X deliveries are expected to be up moderately. That ups the pressure for Tesla, which reported having over 450,000 Model 3 reservations as of March and opened up its Model 3 order system to non-reservation holders in July, to continue rapidly growing its Model 3 production. In its Q2 shareholder letter, the company set a goal of upping weekly Model 3 production to 6,000 units by late August, and insisted it aims to "increase production to 10,000 Model 3s per week as fast as we can." In early September, electric car site Electrek reported that Tesla, which has already missed its share of Model 3 production deadlines, missed its late-August target. However, it insisted the company remains on track to reach its Q3 Model 3 production goal. In recent months, Tesla's efforts to up its Model 3 output have been accompanied by spending cuts -- both to operating expenses and capital spending -- meant to help the company turn profitable and cash-flow positive. They've also been accompanied by high some high-profile talent departures, logistics issues related to Model 3 deliveries and plenty of erratic behavior from Elon Musk -- including remarks about a now-abandoned going-private effort that have sparked an SEC probe. Time will tell whether Tesla can keep all of these issues from badly impacting the speed at which it can work through its Model 3 backlog. If they do have a major impact, then the tougher high-end competition the company is due to see in the next six to twelve months will be coming at a pretty inconvenient time.